Huskies Win First Home Game of the '11-'12 Season! The Husky home opener did not disappoint. The SCSU Huskies beat the UNH Wildcats 7-5 in an exciting, high-scoring game. The Huskies were 4-for-5 on the power play and had 37 shots on net. At two separate points in the contest the Huskies had 3-point leads. This was my first opportunity to see them play (on channel 13-Comcast in the Minneapolis area) and they looked pretty darn good. The team played with a lot of energy and a lot of players had great nights. Drew LeBlanc and Ben Hanowski each had four-point nights with 1g/3a apiece. Nick Jensen and Travis Novak also impressed with 1g/2a apiece and Cam Reid had 1g/1a. Other young players Cory Thorson (energy), Andrew Prochno (positioning, assist), and Jarrod Rabey (monster slap shot goal from the blueline) all were very impressive. Goaltender Mike Lee made 28 saves and looked good despite the 5 goals allowed. A couple of the UNH goals were made off bad bounces/deflections. Lee also had some nice times were he came out a bit and played the puck. Overall, a great way to start at home! 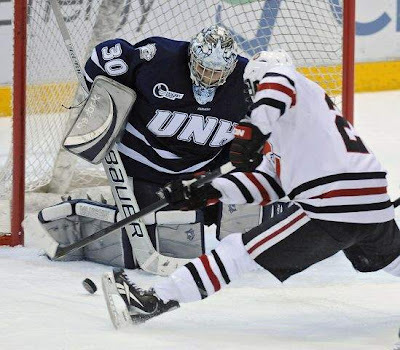 SCSU will return to the ice on Saturday, Oct. 22 with a 7:07 p.m. game against UNH at the NHC. You can listen to the game on KNSI AM 1450 (www.1450knsi.com) or KVSC FM 88.1 (www.kvsc.org). You can watch the game live on Charter Cable channel 87 in the St. Cloud area and it will be televised live on Comcast Channel 13 in St. Paul and Channel 23 in the Minneapolis market. You can also follow along on the live blog at the SCSU Hockey homepage.